Vancouver, British Columbia--(Newsfile Corp. - April 2, 2018) - Inomin Mines Inc. (TSXV: MINE) ("Inomin" or the "Company") reports the acquisition of the Fleetwood zinc-copper-silver-gold property, located in the New Westminster Mining Division of southwestern British Columbia. The 420 hectare property hosts Volcanogenic Massive Sulphide (VMS) mineralization that warrants exploration for the identification of massive sulphide bodies, similar in nature to deposits at Nyrstar's Myra Falls mine on Vancouver Island. 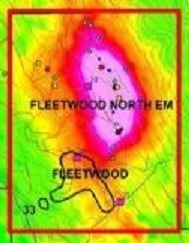 The last exploration drilling done at Fleetwood was by Minnova Inc., (Minnova became Inmet Mining which was acquired by First Quantum Minerals) that discovered the Fleetwood zone in the early 1990s. As part of their program in 1991, Minnova drilled 41 holes at the "Fleetwood zone" intersecting significant VMS mineralization including 31.2 metres of stockwork type mineralization at a depth of 153 metres, grading 2.1% zinc, 0.3 copper, 0.1% lead, 8.1 g/t silver and 0.1 g/t gold. At the 33 zone, located 350 metres southwest, Minnova's drilling returned 23.3% zinc, 1.8% copper, 1.7% lead, 133 g/t silver and 2.3 g/t gold over 3.2 metres at a depth of 170 metres. Minnova's drilling report concluded that further drill testing is warranted. Like the complex metal-zoned VMS deposits at Myra Falls, the Fleetwood property appears to host geologically diverse mineralized bodies with the principle sulfide minerals being sphalerite, pyrite and chalcopyrite. "Exploration at Fleetwood has demonstrated the existence of widespread polymetallic mineralization," states Inomin president John Gomez. "The property merits exploration in several untested areas for high-grade VMS deposits." Infrastructure at Fleetwood is considered excellent. Access to the property is through highways and logging roads. A railway, tidal-barge access and electric power are close to the property. Subject to TSXV acceptance, Inomin is acquiring a 100% interest in Fleetwood for $10,000 and 200,000 shares to CanAlaska Uranium Ltd. (TSXV: CVV). Subscribe to receive future MINE news announcements by visiting https://bit.ly/2pWsA8i. Inomin Mines is engaged in the identification, exploration and development of mineral properties. The Company holds a 100% interest in the King’s Point polymetallic (gold-copper-zinc) project in Newfoundland’s prolific Green Bay mineral region. Inomin trades on the TSX Venture Exchange with the symbol MINE. For further information visit www.inominmines.com.